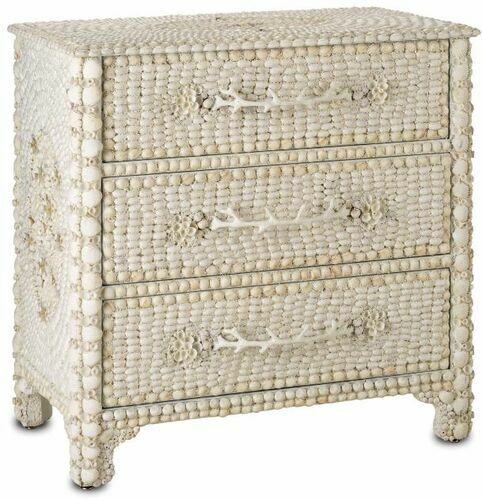 Marchmont Shells Chest of Drawers measures 32"W x 20"D x 33"H and is a stunning creation of natural shells placed in intricate and graphic design that brings the undersea world to life on land. The compact size and ivory shells used in this sideboard make it a signature piece for a special room. The fascination of each individual shell is multiplied over and over to form an ethereal piece that brings a subtle coastal accent to your home...while adding practical storage option. Ships standard furniture freight. Eligible for return or exchange with 15% restocking fee. Please view our return policy for more information.